The Avegant Glyph is a headset with a difference. It's not a virtual reality device, but it has the ability to let you watch 360-degree videos. It's primary purpose is a portable media player that can also transform into headphones meaning you can watch movies and even use it as an up close screen when playing games. There aren't too many other wearable media devices out there - Royole X is the only set that comes to mind - so it's a niche market. After all, what's to stop someone from watching a movie on their tablet or experiencing 360 video with Google Cardboard or Samsung Gear VR? That's the question I tried to figure out in spending time with the Glyph. The answer I discovered? The Avegant Glyph isn't a device that feels polished enough especially for a whopping $699, but the concept certainly shouldn't be brushed under the rug. The Glyph's design is definitely eye catching, and bound to turn heads when wearing it outside the house due to the futuristic and weird-looking way you wear it. Basically, it looks like you're wearing Beats headphones the wrong way. The box comes with a bunch of stuff that you're going to need. Aside from the headset, you get four interchangeable nose pieces, lens cover, carrying bag, HDMI cord, USB cord and guide. The inter-pupillary distance (IPD) sliders found on top move the optics around so you can get a clear image while the nose piece can be moved up or down with a dial. The actual headset can also move to fit your head better. There are controls on the earphones that adjust sound. You can wear the Glyph with an optional head strap as well - which I had to do because it didn't fit properly at first. Even after using the headstrap, it was still a pain to get it in a good spot, find the right nose piece and figure out the eye spacing. Let's just say adjustments weren't fun. Apparently the optics are good enough to work without glasses, which I tried, but my eyes are too awful to use without the extra help. It did help a bit with the comfort level. However, after much experimentation, I finally found a nice spot where I could see without it being too uncomfortable. That said, the Glyph was a little too heavy after an hour or so of Netflix. The nose piece didn't help as it felt like it pushing down on my nose, almost like a swimmer's nose clip. The Glyph experience is supposed to feel like you're in a movie theater, without the annoying people kicking your seat. It's a small field of view - only 40 degrees - so you don't entirely get the sense of being in a theater setting. There's also light bleed above and below your eyes, but that's part of the company's grand plan, allowing you to be more present when other people are around you. It's also easier to see stuff if you need to - like a phone call if you're plugged into your computer or console. Speaking of, the Glyph can't fully function on its own. There's no onboard storage for its own user interface. Rather, it relies on you plugging into a phone, PC, laptop or console. In terms of the display itself, Avegant uses Retinal Imaging Technology and is 720p (or more specifically, 1280 x 720p per eye) and 2 million micro-mirrors. The micro-mirrors do all the processing so LCD screens aren't needed. Images will scale through whatever the Glyph is hooked up to. In usage, everything was sharp and without lag plus bright - almost blindingly bright. There are three settings you can switch between but they're all still squint-worthy. The versatility with switching devices was also nice if I wanted from one device to another through HDMI and HDMI adaptors. However, the field of view is again, pretty small. Add that to the fact that I wasn't able to use the Glyph for more than two hours at a time - as in I'd need breaks in between each usage because of comfort issues with the nose piece - I'd say it's not an experience everyone could enjoy. The intense brightness probably means late night usage wouldn't be good right before bed either. The Glyph headset is meant to play all sorts of media and even function as a second screen if you feel inclined to use it for games or work thanks to the HDMI connectors. It can also process 3D content in addition to the 360-degree videos with YouTube and Jaunt VR. However, that part of the headset isn't quite working yet. There's no head tracking to be found when viewing the videos so plugging in to watch 360 content won't do anything. Apparently an update is on the way since the hardware is already inside the Glyph, so I'll update once it hits. As it stands, good 'ol fashioned Netflix or Hulu (or whatever non-360 videos) it is. Using the Glyph for gaming was similar to having a mobile phone strapped to my face, like Google Cardboard, because of the small FOV. Of course, the image quality was better and there's a larger selection of games to choose from but I don't think I'd use the Glyph often for gaming. There was some getting used to in terms of work related activities - some of this review was typed in Glyph mode - and it's almost like an AR headset where you can see what's around you as well. But rather than a see through visor, it's just open space above and below your eyes. 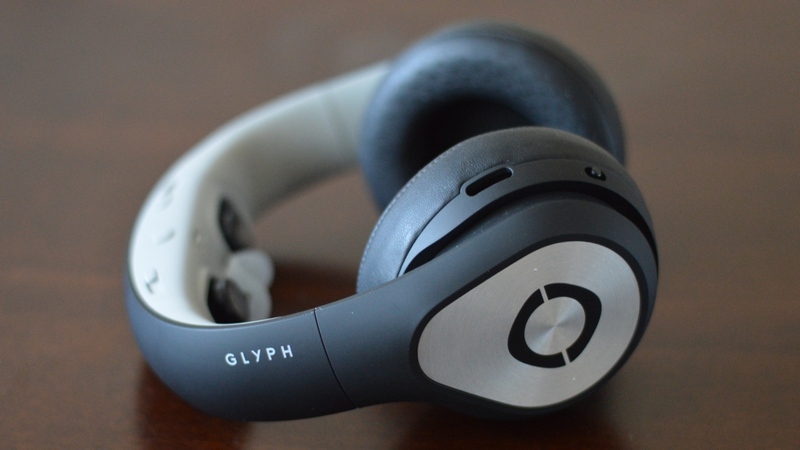 Headphones are another route you can take with the Glyph. There's a magnetic cover provided that you can put over the lenses so it can sit on your head properly. Sound is fantastic when watching movies, and it's no different listening to music. All it takes is a stereo mini plug and you're set. The Glyph was actually also more comfortable as headphones for me. While the Glyph's head tracking isn't exactly up and running, it does work with drones like the DJI Inspire 1. For drone enthusiasts, this could be a potential goldmine considering there aren't a lot of devices that work well as a visual aid. The Glyph is able to run four hours on a 2060mAH battery. It also blinks a warning once it gets closer to the running out of juice and will also flash a warning on the display. It doesn't sound like a lot of time, but when considering its uses, you can watch several episodes of a TV show or even two movies before it has to be recharged. That's pretty good if you're on a short flight or lounging around at home. Recharging at a completely dead state takes around three hours which sounds annoying - however you can still use it when it's plugged in. Convenient. Thankfully, there's no proprietary charge cord. A simple microUSB that Android phones use will do the trick though the Glyph comes with its own. The Avegant Glyph is a great spin on an age-old concept of portable media devices but it's simply not refined enough for all it promises to do. Features are slim and comfort is hard to achieve. Even though the Glyph isn't a VR headset, for $699, you're better off with a full on HTC Vive or Gear VR. If it was more affordable, it may just be worth it thanks to its crisp display and solid sound but for the time being, the Glyph comes with too many caveats. Hopefully, the head-tracking update will make the Glyph worth revisiting.